Some days, it feels like I have so much to learn – about craft, about platform, about critique. When the world of being a writer is too much with me, I look to these and feel my spirit ease. They are locked behind the diamond bars of my nightstand, their bottoms out, stacked pages. I prefer the ones without cute kittens and free of lines although this means I will write crooked. I like the scour of rough paper, and a deckle edge lifts my heart. But I’ll take any journal as long as it’s wide open for wandering. If it will slide between my fingers without catching on even the paper-smoothed skin, I love it. The same if it will sway under my touch before pushing back against my hand – velvet or a buzz-cut head. But if it will slide onto my foot and cushion it with soft, fabric that can only be called fuzzy, I love it best. A cold autumn afternoon’s gift rising from my soles. 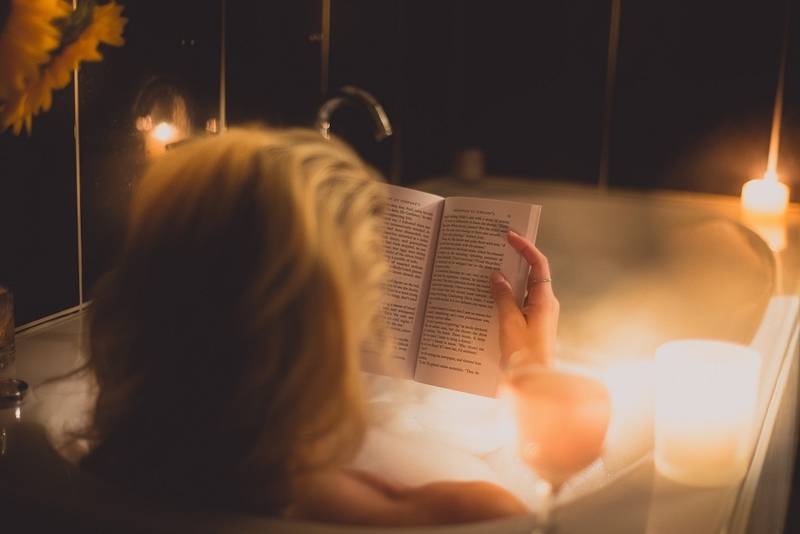 I don’t know why – until a few days ago, I thought I was the only one, but Kelly loves the same – I love a hot bath where I can let the water run for long, long minutes. It’s the sound, I think, the white noise of it. I’ve even been known to free the plug with my toes – since my hands are full with pages – and let it drain so I can keep filling the tub with heat and sound. The shadow of a lamp darkens the corners. The glow is the yellow of tempered light. I don’t have to tolerate the falseness of a bulb so high overhead it only shades my soles. My space. It reminds me of the perfect library carrel, the only place in the world where we use that word. I want the rasp to be almost silence. The way you only hear your heartbeat when you settle onto your pillow. Pen to paper, I want to not hear it, not feel it even, except in the motion like wind lifting the hair from behind my ears to bring cool to the nearly forgotten folds. A felt tip, maybe. Or the Uniball Vision Elite. . . one that gives me the shapes I treasured in elementary school pencil tips gone skewed at the tip, where shadows and points play together. But without the pressure of even my hand. Leave me alone there after you convince me that you really are fine to run errands or sit by the water. Find me a bookstore near your favorite fishing hole. Then, I will wander amongst the artifacts I love most in the world. I will lift them to my nose and smell their wonder. I will lean them against each other. My fingers will bounce along their spines. A porch. A breeze. Two friends who know the gift, the languish, the labor of words. Andi Cumbo-Floyd is a writer, editor, and farmer, who lives on 15 blissful acres at the edge of the Blue Ridge Mountains with her husband, 6 goats, 4 dogs, 4 cats, and 22 chickens. Her books include Steele Secrets, The Slaves Have Names, and Writing Day In and Day Out. You can connect with Andi at her website, andilit.com, or via Facebook and Twitter.